Former North Dakota lawmaker Rae Ann Kelsch died last month at age 58 after eating raw oysters at a New Orleans restaurant. The alleged culprit: a fast-moving bacterial infection — linked to consuming raw or undercooked shellfish — that caused her organs to shut down. The place where Kelsch ate oysters has not been publicly released. Oysters have long been a trademark of southern cuisine, but they also pose health risks for some. “There’s always going to be a small amount of risk,” says Dr. Fred Lopez, who studies infectious disease at Louisiana State University’s Health Sciences Center. Lopez says the biggest danger comes from a pervasive bacteria called Vibrio vulnificus, which is what reportedly killed Kelsch. Vibrio vulnificus naturally thrives in brackish waters where the temperature is above 68 degrees Fahrenheit. As a result, it’s actually more common in the Gulf of Mexico, where the waters are warmer, than on the East and West coasts. 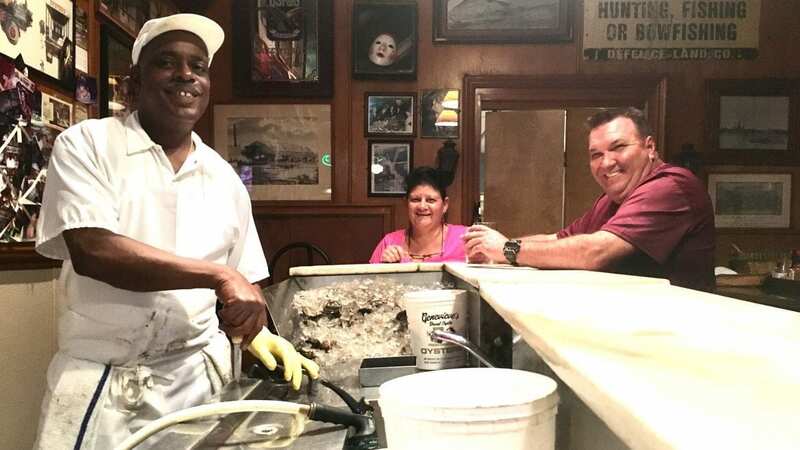 Thomas “Uptown T” Stewart is the famous oyster shucker at the New Orleans restaurant Pascal’s Manale. Stewart has worked at the restaurant for more than 30 years, and he knows his clients well. It seems like he’s always shouting “What’s happening, y’all?” to people walking through the front door. Stewart’s side of the bar is covered by a pile of raw oysters and ice. One by one he digs them out, pries open the shells with a knife and frees the meat with effortless speed. Brent and Paula Coussou are on the other side of the bar. They’re each nursing a beer, and there’s a row of empty oysters between them. They say they’ve been coming to the restaurant for as long as Stewart has been working there. That may not be an official term, but he’s referring to those crunchy bits of shell that sometimes get slurped down with the raw oyster. Coussou heard the news about the politician who died, but he’s not worried. He says he’s never gotten sick. Although many oysters are exposed to Vibrio vulnificus, they aren’t dangerous to everyone. People with specific pre-existing health problems are most vulnerable. That list includes liver disease, diabetes, kidney disease, alcoholism and cancer. Generally speaking, people with weakened immune systems are the most at risk. Lopez says those people shouldn’t eat raw oysters — period. Proper cooking kills the bacteria completely. All things considered, Vibrio vulnificus infections are still very rare. But when people with weakened immune systems are infected by Vibrio vulnificus, anywhere from one-third to one-half of those people die. “That’s a very high mortality rate,” says Lopez. That’s why there are very strict regulations around oyster harvesting. The Interstate Shellfish Sanitation Conference (ISSC) sets those regulations for the Food and Drug Administration. “Probably, shellfish and milk are the two most regulated foods in the country,” says Ken Moore, Executive Director of the ISSC. There’s an old adage, that you should only eat raw oysters in months with an “R.” September through April — basically the cooler months. So this isn’t a new idea. Moore says regulations have tightened over the last 10 years or so. For example, during the warm summer months, oysters that are meant to be eaten raw must be refrigerated within an hour of harvesting. He says it’s had a positive effect. Dr. Alex Billioux agrees. He’s the assistant secretary for Louisiana’s Office of Public Health. “It is very, very rare to become ill from eating oysters,” says Billioux. And though infections from raw oysters are down, Billioux says the amount of Vibrio vulnificus in the water is actually increasing due to warming waters. “I definitely expect our jobs to become harder as the waters continue to warm because of climate change,” he says. That could mean more testing, scrutiny, and risk in the future. This story comes to us from member station WWNO in New Orleans. Support for the Coastal Desk comes from the Walton Family Foundation, the Greater New Orleans Foundation, the Foundation for Louisiana and local listeners. You can listen to the audio here. Copyright 2018 WWNO – New Orleans Public Radio. To see more, visit WWNO – New Orleans Public Radio.